AMAZING!!! To see these two pictures side by side makes me want to cry in a good and bad way. The good is that she looks SO great! The bad is that I feel guilty that this chair took over 3 years to get for Makenzie. I choose to focus on that fact that we have it now and it is working so well!!! Makenzie's PT came first thing this morning and we put Makenzie in the chair. She looked at all the contact points and how Makenzie was sitting in the chair. Other then the headrest being too big the consensus was all good. After she took Makenzie out of the chair she sat and showed her how to do a pivot transfer into her chair. She did it! It is still a transfer with full assist but it should make getting her in and out of the chair a lot easier for me as she gets bigger! Exciting! I took a few pictures with my phone and sent them to Makenzie's PT. She concurred with me that her left hip was a bit rotated but it was ok to leave her like that as long has her trunk was straight and her head was in mid line. Makenzie ate her lunch while watching Sesame Street with her head up and in the middle for the whole hour!!! That is a first ever! Last night when we got home the boys wanted to see her in her new chair so bad but after a whole day of poking and pulling I was hesitant to mess with Makenzie to much more. They understood and first thing when they got home from school they wanted to put her in the chair. I told them they had to wait until it was time for her to eat so that she wasn't in it for too long and I went upstairs. When I came back down I found Makenzie in her chair with my 13 year old pushing her around the therapy room. (blatant teenage defiance... LOL!) I love how much they love her! I sat my son down and explained that Makenzie had to go into the chair a very specific way. I showed him how her bottom looked in the chair the wrong way and then the right way. I explained why it was so important to get Makenzie into the chair the right way while he sat intently watching and listening hanging on every word I said! He watched while I put her in the chair. He asked a few questions about the process and the wheeled her off as soon as I was done. He got out the iPad for Makenzie to play with. They had a wonderful time! I pulled out our iPad mount and put it on the chair to see if Makenzie would reach up for it and she thought that was so much fun! Even though this is a horrible picture I wanted to post it because it shows how much movement Makenzie is getting in her arms with the support she needs. She is reaching up with her head up and a smile on her face instead of the normal open mouth! God is so good!!! A good day it was. Even though it started out a bit rocky. That story will come tomorrow but for now I am calling it a night! Once again thanks for the prayers! 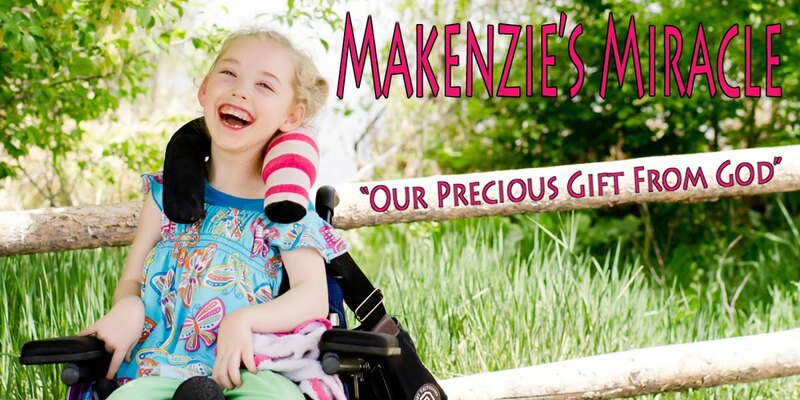 I God's hand all over Makenzie's new wheelchair! He listens and has answered in a huge way!! That's amazing! I'm so happy for you and for Makenzie! Thanks for sharing that bit about her brother...I love watching siblings show their love! WOW So nice to see her sitting so great. The head position is great. Joey does the same with his leg, but he does it because his abductors pull in. I just move his leg back in. So glad to hear!! Sorry it took so long, but she looks great! Congratulations to you and Makenzie!!!! Makenzie looks so grown up in her new chair. WOOT!! So happy for you both!! What an awesome improvement.